This topic describes placement of an intravenous (IV) catheter into the external jugular vein. A similar technique can be used for placement of IV catheters at different anatomic sites. Note that many institutions will not allow administration of a high-pressure IV contrast agent into an external jugular vein. No absolute contraindications exist for external jugular vein cannulation. Veins with high internal pressure become engorged and are easier to access. The use of dependent positioning, proximal compression with a finger, “pumping” via muscle contraction and the local application of heat or nitroglycerin ointment can contribute to venous engorgement. The external jugular vein begins at the level of the mandible and runs obliquely across and superficial to the sternocleidomastoid (see the image below). Scales K. Intravenous therapy: a guide to good practice. Br J Nurs. 2008 Oct 23-Nov 12. 17 (19):S4-S12. [Medline]. McNaughton C, Zhou C, Robert L, Storrow A, Kennedy R. A randomized, crossover comparison of injected buffered lidocaine, lidocaine cream, and no analgesia for peripheral intravenous cannula insertion. Ann Emerg Med. 2009 Aug. 54 (2):214-20. [Medline]. Burke SD, Vercler SJ, Bye RO, Desmond PC, Rees YW. Local anesthesia before IV catheterization. Am J Nurs. 2011 Feb. 111 (2):40-5; quiz 46-7. [Medline]. Valdovinos NC, Reddin C, Bernard C, Shafer B, Tanabe P. The use of topical anesthesia during intravenous catheter insertion in adults: a comparison of pain scores using LMX-4 versus placebo. J Emerg Nurs. 2009 Jul. 35 (4):299-304. [Medline]. Ortega R, Sekhar P, Song M, Hansen CJ, Peterson L. Videos in clinical medicine. Peripheral intravenous cannulation. N Engl J Med. 2008 Nov 20. 359 (21):e26. [Medline]. Dougherty L. Peripheral cannulation. Nurs Stand. 2008 Sep 3-9. 22 (52):49-56; quiz 58. [Medline]. Aziz AM. Improving peripheral IV cannula care: implementing high-impact interventions. Br J Nurs. 2009 Nov 12-25. 18 (20):1242-6. [Medline]. Panebianco NL, Fredette JM, Szyld D, Sagalyn EB, Pines JM, Dean AJ. What you see (sonographically) is what you get: vein and patient characteristics associated with successful ultrasound-guided peripheral intravenous placement in patients with difficult access. Acad Emerg Med. 2009 Dec. 16 (12):1298-303. [Medline]. Roseman JM. Deep, percutaneous antecubital venipuncture: an alternative to surgical cutdown. Am J Surg. 1983 Aug. 146 (2):285. [Medline]. Stein JI. A new technique for obtaining large-bore peripheral intravenous access. Anesthesiology. 2005 Sep. 103 (3):670. [Medline]. Supplies for insertion of IV catheter. Visualization of external jugular vein. Visualization of external jugular vein: proximal pressure. Collapse of external jugular vein during inspiration. Skin preparation during external jugular vein cannulation. 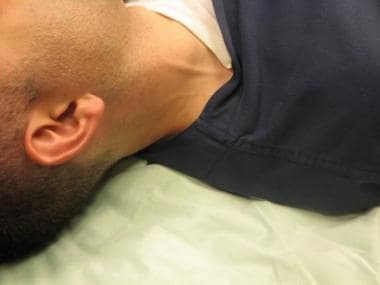 Skin traction during external jugular vein cannulation. Insertion of needle into external jugular vein. Note very shallow angle. Flashback during external jugular vein cannulation. Sliding hub of catheter over needle and into vein. Aspirating blood and flushing venous access device with saline. Securing venous access device after external jugular vein cannulation. External jugular vein cannulation. Video courtesy of Gil Z Shlamovitz, MD.